This simple slaw is made with just 8 ingredients, but it gets wonderful sweetness & crunch from apples, kohlrabi, dried cranberries, and pine nuts. You may or may not have noticed, but I love salads. I intended to start November off with big hearty Thanksgiving inspiration… but, well, I’m not sure if the thought of mashed potatoes made my jeans feel tighter or if it was all the Christmas cookies I ate last week (don’t ask)… this week I ended up craving soups and, especially, salads. 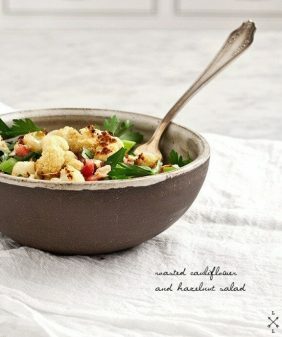 I’m really excited about this salad because it’s so simple yet so delicious with all of its shred-y, crunchy textures. If you have a mandoline, this will go really quickly. If you don’t, you can use a sharp knife, just try to slice everything as thinly as you can. (And a side note: please use the safety attachment even though I didn’t here). Shredded brussels sprouts and apples are the base of this salad. At the last minute I also tossed in some kohlrabi that had been sitting in my fridge for weeks as if it were waiting to be included in this salad. Sliced into thin matchsticks, it offers a really nice crunch. If you don’t have kohlrabi, you can skip it. But don’t skip the dried fruit or the toasted nuts. It’s these sweet & salty flavors that bring everything together. 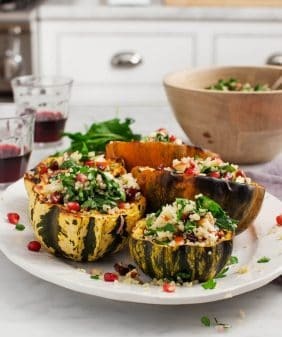 We ate this salad with big bowls of pumpkin soup, but it’ll also be great as a lighter option on your Thanksgiving table. Love Brussels sprouts? Roast them or try this salad! 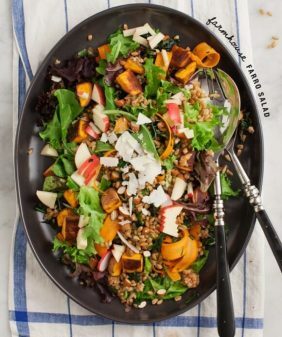 This light salad would be a great Thanksgiving or holiday side. It's already gluten-free, and you can easily skip the cheese to make it vegan. I have this Benriner Japanese Mandoline and I love it. Ooh I love the look of that salad – fresh, crunchy and full of flavour, perfect! shoot, I think I have to get a mandolin now! Beautiful salad and pictures!! Beautiful soup, and I love kohlrabi in anything. I am definitely deathly afraid of mandolins though – could you recommend an alternative way of slicing the sprouts, or is a food processor my best option? You could do it with a sharp pairing knife, the just try to get the thinnest slices you can (and same with the apples and the kohlrabi). What a great recipe! I thought Kohlrabi was just eaten in Germany! I’m surprised to see this ingredient outside German borders! Ha, well I think it’s become more popular over the last few years. (At least, it’s at my farmers markets all the time). What do you like to make with it? We usually eat it raw, with good olive oil, Maldon Salt and pepper. 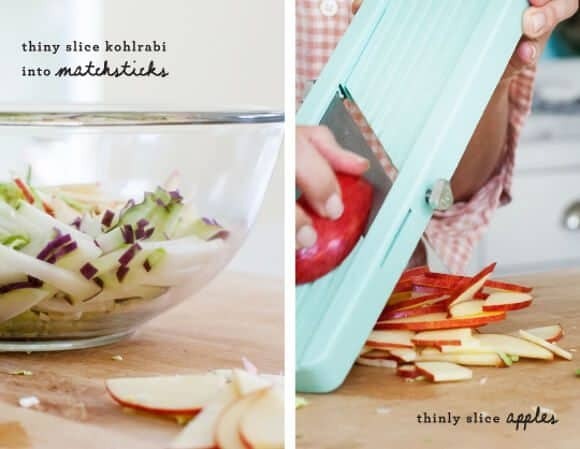 Here kids eat Kohlrabi like apples, as a snack! Anyway, I’m Spanish and in Spain you do not eat kohlrabi: it’s something farmers give to the cows!!!! Mm, I grew up eating kohlrabi. I loved in Indiana, but my dad always grew it and we just eat it with salt! Definitely noticed your salad addiction, and I love it! Awesome recipe! You are totally right about this being a great idea for a Thanksgiving side dish! Looks amazing! 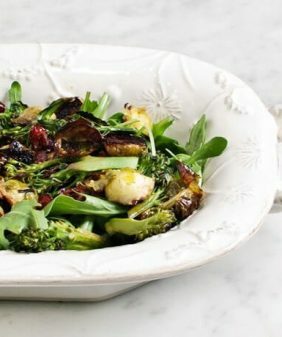 Lovely salad, I wouldn’t have tough of shared Brussels sprout in a salad, will try it for sure. You and I are totally on the same page with the love for salads, brussels sprouts, and not using the safety attachment for the mandolin. 🙂 I actually blogged about some of my kitchen disasters last week, and it’s a wonder all 10 of my fingers are still in tact. This salad looks absolutely stunning! Kohlrabi isn’t a common item in my grocery cart but I’m more than willing to buy some to make this! I love the idea of shredded brussel sprouts in convenient slaw form. Such a great fall salad. Yum! This looks like a great Thanksgiving salad option! Definitely bookmarking! 1. Trendy but different. 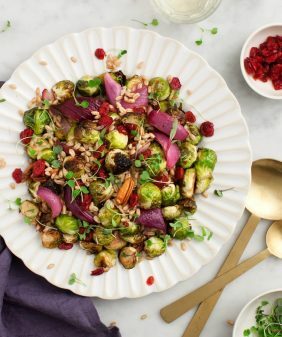 I’ve seen so many recipes with shredded brussels sprouts lately, but just like always, this recipe is so unique! 2. I learn things! With nearly every post, not only do I have great pictures to look at and a story to enjoy, but I’m either introduced to a food (I have to google kohlrabi), or a new food use, or a fun fact…always something! I’m excited about this salad too. Love Brussels sprouts any way and am always trying to find new ways to use kohlrabi beyond my favorite way which is juicing it. This fresh slaw-like version would actually be a perfect addition to lighten up a Thanksgiving meal. This salad looks great. And I love the photography as well – thanks for the recipe! lovely salad!! easy and yummy! 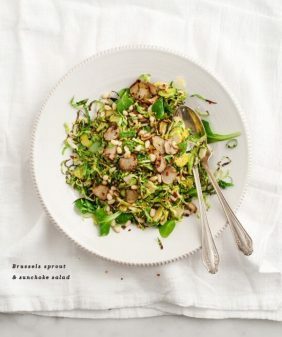 I fell in love with brussels sprout salads last year! I came across a local Philly vegan chef who has a killer recipe including “coconut bacon” and have been making it ever since. I like your addition of kohlrabi and would like to try that next! Hello! First of all – huge fan! Also, will you please tell me where you bought your mandoline? I have been looking for one like that but cannot find one I like that works well. amazon! The link is right under the recipe. It’s not the sharpest one ever but I like the size and price of it. It fits in a drawer, and since I never use the safety piece I feel ok knowing that I won’t slice my finger off. Yes!! I make a very similar salad almost once a week during fall and winter. I add avocados and use slivered almonds instead of pine nuts, but everything else is the same. It’s delicious! I love your photos and the delicious recipes! Yum! I adore the texture of shredded Brussels sprouts. Hi, I just came across your blog today and absolutely love your recipes! 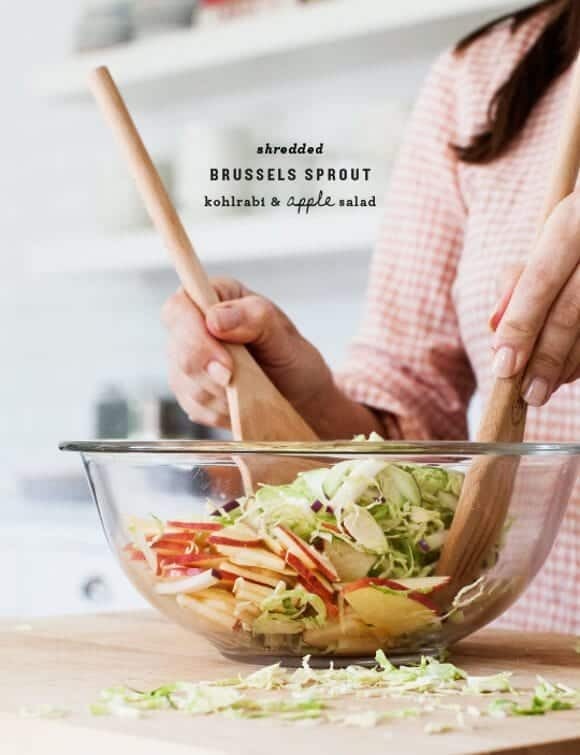 Your brussels sprouts and apple salad looks great – it could be a good one to try on our Thanksgiving table this year. I’ve never thought of eating brussels sprouts grated raw. Is it like green cabbage? I just made this for lunch with toasted almonds and feta. Delicious. This was definitely a mouth workout – lots of amazing crunchy texture! Thanks for another great recipe. We always eat salad at dinner and what a good one! I add some pomegranate fresh arils. This is a perfect side for a BBQ pulled beef burger. This looks wonderful. I love roasted Brussels sprouts, but I’m embarrassed to admit I didn’t know you could eat them raw! I’ll definitely give this a go. Finally finished making this salad today. On Wednesday I cut my finger on the first shred of the sprouts on the mandolin and fainted 15 minutes later! I love this salad. it is so tasty and the different textures make it sing! We have this often. Thanks for the recipe! Thank you for the terrific recipe. Super simple and really fresh, great taste. The crunchy texture of this light salad is the perfect foil for all the heavy food coming out of the kitchen on Thanksgiving. Can’t wait to serve it to my brother in law who detests brussels sprouts! He’ll never know….. This was unbelievable. We made this as a side at a heavy Thanksgiving meal, most of which I was not partaking of, and lots of heavy food meat eaters had second helpings of this fresh crispy salad. I made it earlier in the day, but it held together very well. You are such an inspiration. Made this as a fresh ‘n raw component of Thanksgiving. It was delicious, though I forgot the pine nuts. I had only one kohlrabi but it was still good. I shredded the sprouts and apples using the slicing blade of my food processor. Super easy! I did the same with the kohlrabi, then stacked the slices and cut them julienne. One word of caution — add lemon juice, salt and pepper first. Lots of lemon and plenty of salt. Add much less oil than you usually would. I probably used twice as much lemon as olive oil. I tasted it after it had stood for a couple hours thinking it might need a bit more oil but nope — the tartness of the lemon offset perfectly the bitter of the sprouts and the sweet of the apple. All was balanced by the salt. Perfect! I would like to say thanks for sharing this information here and I really appreciate this post,Babmar is one of the most trusted brand name in weather-resistant handwoven outdoor furniture.